A native to Fayette County, Judge Thompson is a graduate of Maryville College and Cumberland School of Law. Prior to being appointed to the bench by Governor Nathan Deal in April, 2013, he was elected to serve as Fayette County Magistrate Court where he presided over both civil and criminal matters. 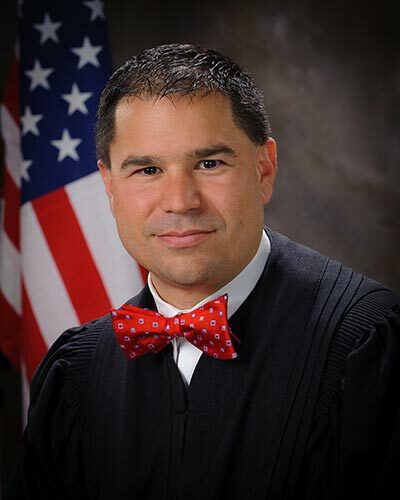 Judge Thompson was elected Fayette County State Court Judge in May, 2014, in an uncontested race. Judge Thompson has received a number of professional and community awards. Judge Thompson was re-appointed as the State Court Representative to the Chief Justice of Georgia's Judicial Council Access, Fairness, and Public Trust and Confidence Committee. After serving as Chief Judge of the Trial Advocacy Board, he was asked to serve on the Order of Barristers. He was elected by his peers to serve as President of the Fayette County Bar Association. After serving as coach of the Fayette County High School and McIntosh High School mock trial teams, he served as Statewide Chairman of the High School Mock Trial Program. Judge Thompson currently serves on the Training Committee of the Council of Accountability Court Judges. Judge Thompson has organized and lectured at The People's Law School of Fayette County. He is currently an Adjunct Professor at Point University. He also served as a member of the Fayette County Development Authority. Judge Thompson is a graduate of, and current presenter for, Leadership Fayette. He is an active member of the Peachtree City Rotary Club, a member of the Board of Directors for AVPride, The Joseph Sams School, and the Board of Advisors for The Southern Crescent Chorale. Most weekends, you can find Judge Thompson at the soccer fields either coaching or refereeing local youth games. He is a Commissioner for Georgia Soccer Officials Association. Judge Thompson and his wife, Alisha, have three children, and reside in Fayetteville. They attend Fayetteville First United Methodist Church. With the recent formation of the Fayette County State Court DUI Court in January 2016, Judge Thompson created the first accountability court in a State Court in the Griffin Judicial Circuit.